Rocket Racer - Race at the crazy rockets competition at amazing speed for an adrenalinic and exciting experience never seen before! Overcome all the various tracks surrounded by fantastic environments ranging from colorful tropical beaches to super technological metropolis, passing by beautiful and snowy mountain landscapes. Choose your character between Fox Rock and Sheena Ramone, jump in the competitions by pushing hard on the accelerator and using all sorts of weapons and special items to stop hopelessly your opponents race! Finally, remember to accumulate money and use it in the shop to upgrade your racers to become a real fury impossible to overcome! - Complete all the 3 Cups (Beach, Mountain, City) and 27 Tracks! - Use a variety of weapons and super powers to win every race! - 3D graphics of the highest quality and in Full HD!!! - Supports Google Play Games: compete with players all around the world thanks to leaderboards! - Supports both smartphones and tablets! - Supports any HID Gamepad! 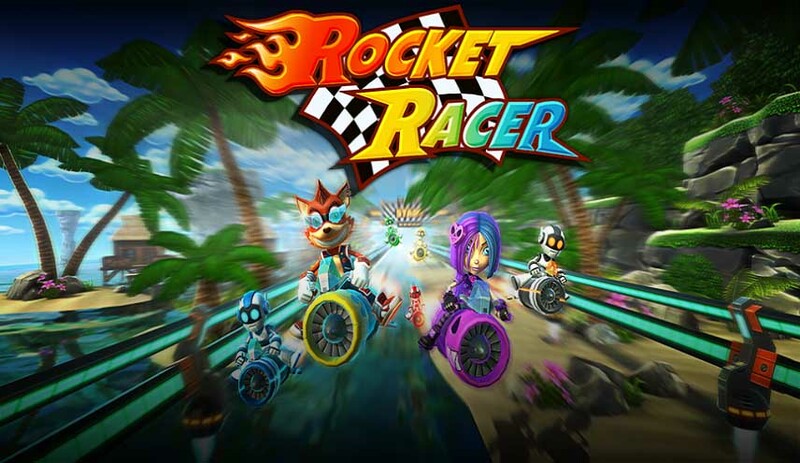 Rocket Racer: install APK and play the game.